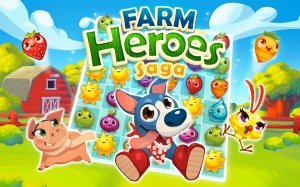 A new game from the creators of Candy Crush has been launched: Heroes Farm Saga. It has a game fashion similar to the famous saga of candy’s puzzle where you have to collect a minimum of three equal fruits or vegetables with the purest Bejeweled style. Every time we place together three or more of them, either horizontally or vertically, they disappear and the top rows fall to take their place. 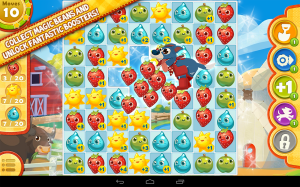 In principle, Farm Heroes Saga looks it might be just a copy of Candy Crush, as the two have a very similar game style. However, several differences between them can be found in the requirements to complete the different levels. In this case, we need to obtain a certain number of fruits or vegetables with a given movements or even ‘collect’ animals. In general, the game is not as focused on in-app purchases as others from that series. In this case, the ‘powerups’ are more reasonable than in Candy Crush. If you do not want to pay to dispose of them right away, you can obtain them after succeeding in certain levels. Also, if we use them, after 12 hours we obtain them again for free, without having to make any in-app purchase. In this sense, Saga Heroes Farm is, potentially, a more attractive game for players who do not want to spend much money on the game. However, it follows the life’s structure of other games of the company. When we fail to complete a level, we lose a life, and we have a limited number of them, which regenerate over time or with a visit to the store. The graphics are very good and the overall game is entertaining and fun. If you liked Candy Crush, you should give it a try. You can download Heroes Farm Saga from the App Store or the Google Play.